Jana here again. So, how do you like the new Magic Fall collection? I L.O.V.E. it! It has brilliant autumn colours but yet it is pretty universal (as I will show you today). My favourite paper? The watecolour one with brown, green and light blue “stripes”. Oh, and the phrase stamps! So versatile! Anyway, this was a bit of a last minute project. The post service in our country is pretty bad and I got my parcel from Monika on Friday. Luckily, I had these brilliant pictures from a visit to Dinopark in England. Who would think that this fall collection will be a perfect match to dino themed things? I had just a few pictures so I used a 6x8 page protector (which can fit in big PL albums). Both pages have a similar look. I love the small 2x2 pockets and those fill in card. The paper I used is from the TN collection. For Project Life I prefer using smaller papers because the pattern is just more cute. I used stickers, stamps and simply couldn’t resist using a beautiful piece of chipboard. One of the papers has cards to be cut out. I used the one with camera in the middle which I covered with a photo. The title just says it all, doesn’t it? 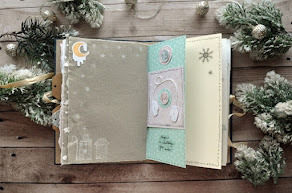 In this PL spread I used some stickers again, stamps and transparent stickers which are great for photos. And since this project is really small and I had already had something else finished from the older collection, here is another PL page. As you can see I was a bit adventurous with the layout of the pockets. Originally, this was a protector with four 6x6 pockets. I usually have plenty of photos to use therefore I used my Fuse Tool to customize the page a bit making little 2x2 pockets. I used the Let’s Go collection. At the beginning I planned to use the palm tree leaves paper for the King Kong pictures but in the end I went for a more simple design. I love wood veneer! So I used few titles here and there.